The trickiest — and longest — aspect of this Chinese classic is assembling the wontons. Making the filling and simmering the wontons in broth, however, is a snap. This recipe is a variation on the wonton soup made by a friend, who likes to use ground turkey. Ground pork, chicken, or even tofu would work well, too. Place the wonton ingredients (except for the wrappers) in a food processor and blitz briefly, just until mixed. Scrape filling into a bowl. Put a little water into a small bowl. Place 1 tsp. filling in the center of a wonton wrapper. Dip your forefinger in the water and trace a line along two sides of the wrapper; fold into a triangle and seal. Place a bit more water on the two long corners of the triangle and press together into a tortellini-like twist. (It's OK if these aren't beautiful; they'll cook just fine in the broth so long as the filling is sealed inside.) 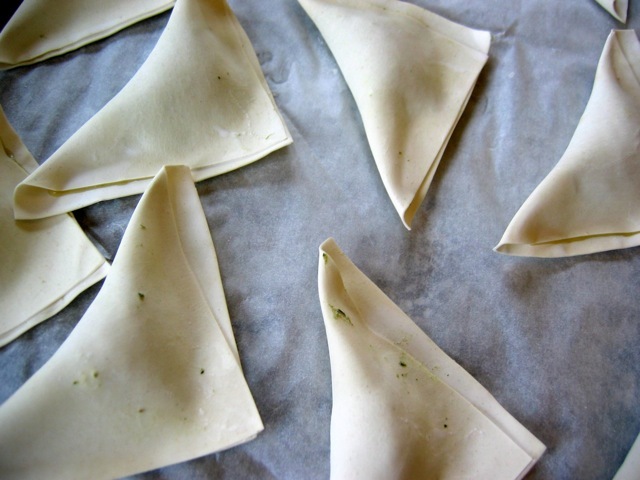 Place the finished wonton on a baking sheet. Repeat until all of the wrappers are gone; freeze the remaining filling for another wonton day. Bring the broth to a simmer in a large saucepan. Toss in the scallions, sesame oil, and soy sauce. Carefully put wontons into the broth (about 6 to 8 per person) and stir to prevent the wontons from sticking to the pan. Simmer until the wontons float. Serve hot, with more sesame oil and soy sauce at the table. Freeze any leftover wontons on the baking sheets; when frozen, scoop them up and place in ziplock bags for future soup days. You can replace the spinach with finely shredded fresh cabbage. It's not traditional, but adding some miso paste to the broth makes for a richer-tasting soup. Variation: Instead of simmering the wontons in broth, fry them until brown and bubbly in about an inch of hot peanut oil and serve as an appetizer, with a dipping sauce made from soy sauce, vinegar (black rice or rice wine is good), and a little chile oil.